The Moscow Metro can appear a confusing and intimidating place at first glance. 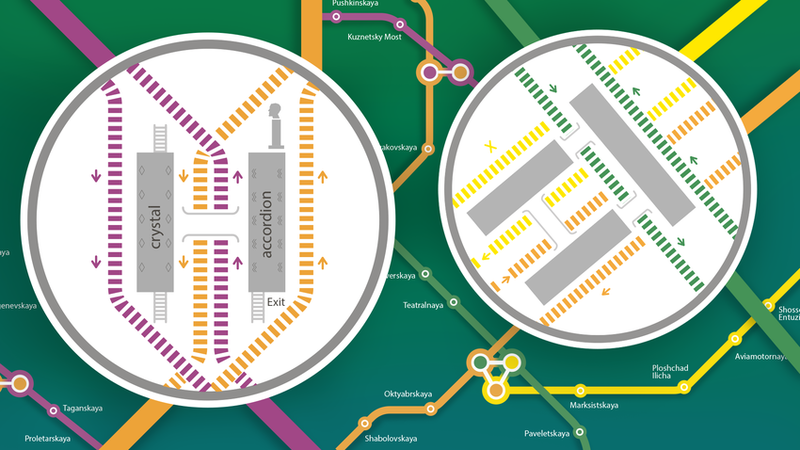 This guide will help you learn about double and identically named stations, get to know train directions and time gaps, and also discover the main secret of using the Moscow subway. Even Muscovites mess up now and then - confusing stops and going backwards, miscalculating time and missing their transfer. So here are 6 things you'll need to learn to manage the world's 6th largest subway. The entrance to 'Arbatskaya' station of Line 4. Architect L. Teplitsky, 1935. 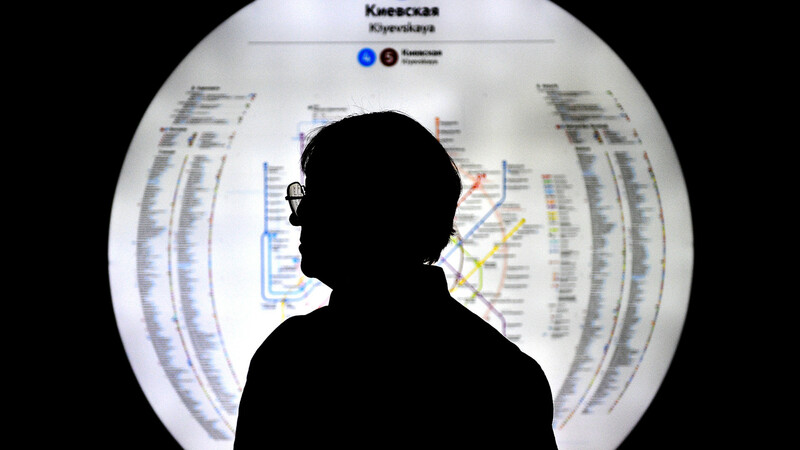 There are several stations with the same name: for example, Kurskaya on the circle line and Kurskaya on the radial line; same for Komsomolskaya, Belorusskaya, and so on. Also, there are two pairs of stops that are named identically, but are not connected. They are: two Arbatskaya stations and two Smolenskaya stations; and geographically, they are very close to each other, but not connected. There is Arbatskaya on line 3 (a big one, with changes to lines 1, 4 and 9); and Arbatskaya on line 4, without any changes. Two Smolenskaya stations are also on lines 3 and 4. So if anyone arranges a meeting with you on Arbatskaya or Smolenskaya, make sure you both are talking about the same station! Currently, there are two stops where you can get lost or even go in the wrong direction, because the platforms are organized in a different way as opposed to the majority of stations on the Moscow Metro. 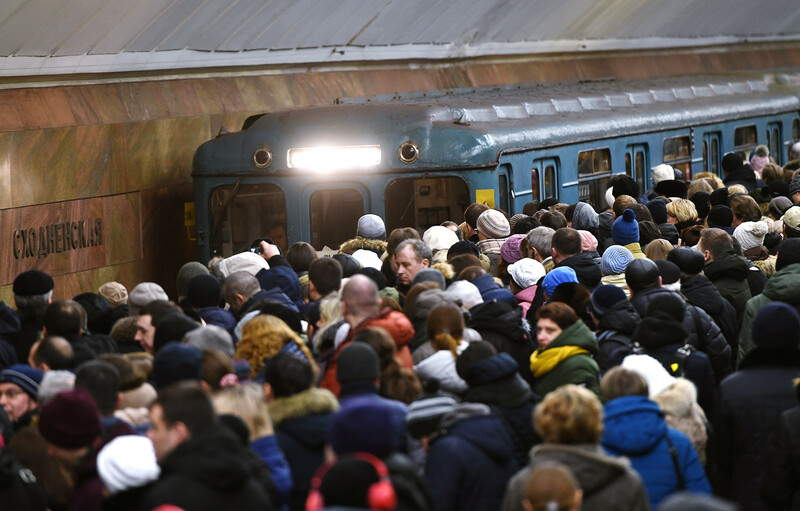 The most important one is Kitay-Gorod, one of the most crowded subway junctions. 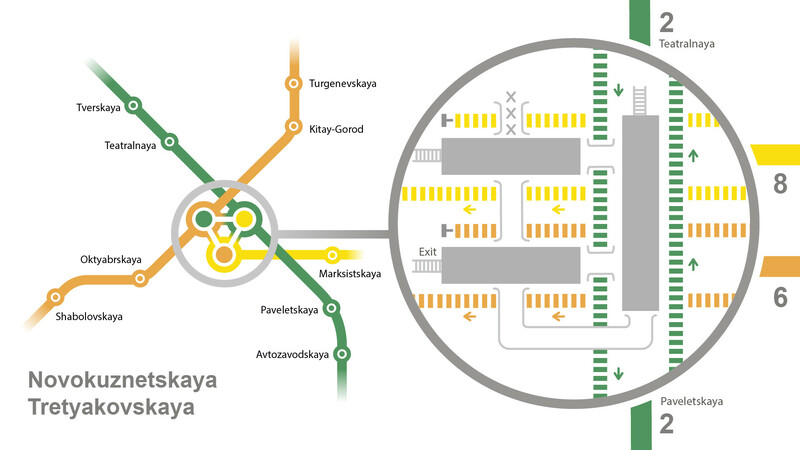 When arranging a meeting at Kitay-Gorod, you can’t use the usual Moscow meeting spot “in the center of the platform,” because there are two stations connected by a passage in the center and they look almost identical (thank you, designers of the Moscow Metro)! It’s easy, however, to tell one Kitay-Gorod platform from the other, if you know one trick: the platform that has trains going south, in the direction of Tretyakovskaya on line 6 and Taganskaya on line 7, is nicknamed “krystal,” because its columns resemble crystals. The one with trains going north to Turgenevskaya on 6, and Kuznetsky Most on 7, is called “garmoshka” (“accordion”), also based on the form of the columns. Phew! Easy to remember now! To find each other at Kitay-Gorod, make plans to meet “next to the big head,” the monument to Viktor Nogin, a Bolshevik leader. His monument in the form of a head is located on the northern side of the station, where one exits the station by the stairs (there is an escalator at the opposite end). The second “double platform” is Tretyakovskaya, joining lines 6 and 8. It’s less complicated, and the platforms differ in appearance. One of them has a closed passage in the center, and that’s the one leading south; Oktyabr’skaya station is next. From the other Tretyakovskaya, trains leave for line 8 (where it’s the first stop), and northbound for line 6 to Kitay-Gorod. Easy! 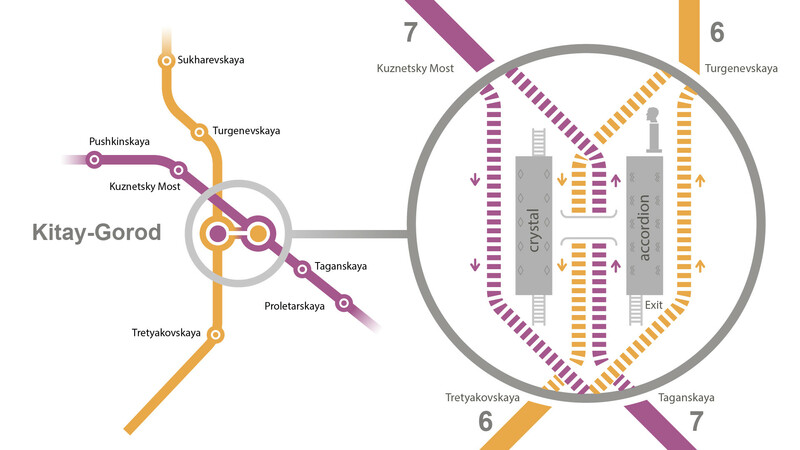 From Kievskaya station of line 4, trains can go in two possible directions: to the “old” part of the line, next station Studencheskaya, last stop Kuntsevskaya; and the “new” part, next stop Vystavochnaya, last stop Mezhdunarodnaya, where the Moscow City business complex is located. The “new” part is used less frequently, and trains to Vystavochnaya arrive at longer intervals. To get it right, read the name of the final stop on the train’s locomotive when it arrives in the station, and look at the lightboxes above the tracks. A common mistake for non-Muscovites visiting Moscow for the first time is to think that one of the Moscow airports is located near the Aeroport metro station, which is 10 minutes from the center. This mistake can eventually lead to missing your plane! 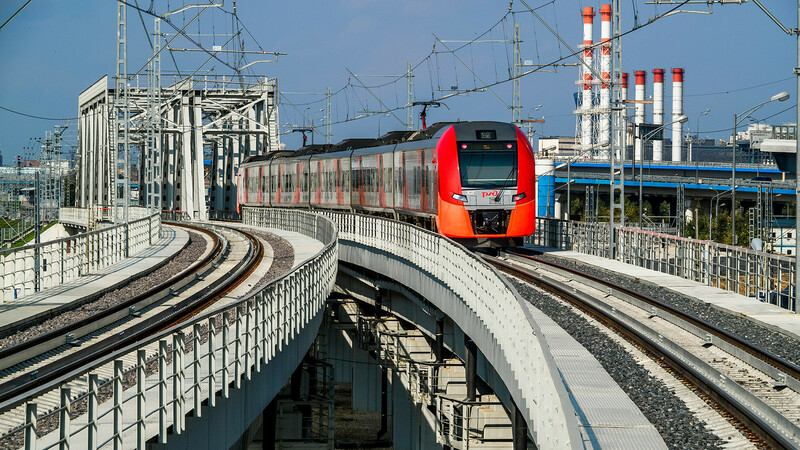 All Moscow airports are far from the city center and are accessible by Aeroexpress trains from the Belorusskaya, Kievskaya and Paveletskaya stations. By the way, the name Aeroport owes to an old experimental airfield, now already covered with housing. Moscow is a bustling city where thousands of people hurry in different directions. For most, it’s a daily routine that they perform almost automatically. So they might be mildly disappointed if during rush hour they stumble upon tourists walking slowly to see the Moscow’s Metro fascinating architecture. People in Moscow are usually very polite (impoliteness can be very costly in a megapolis like this), so at the very least they keep their emotions to themselves, and you would be politely trampled and gently shoved out of the way at the blink of an eye. Our advice is simple – to best tour the Moscow Metro, choose the hours from 11 a.m. to 3-4 p.m., and then after 9 p.m., when there’s considerably less people on the metro. If you happen to be in the Moscow Metro at rush hour, just go with the crowd and don’t stop. Come back at a time when you can have more time to enjoy the brilliance of one of Moscow’s greatest treasures. 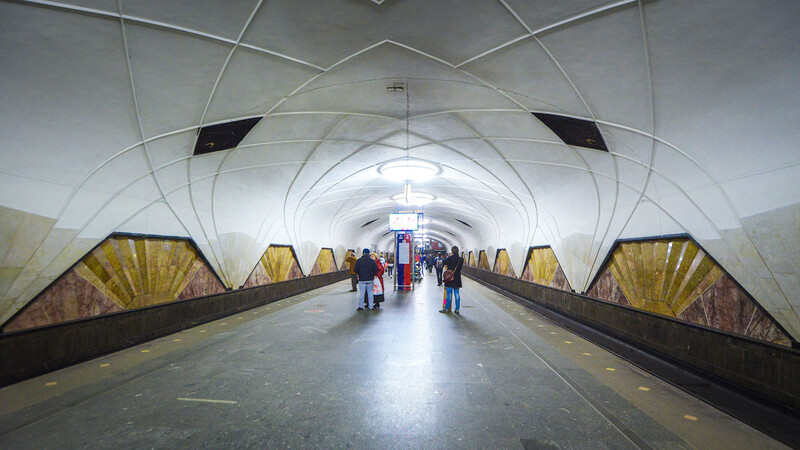 We have more tips for managing the Moscow Metro like a local. 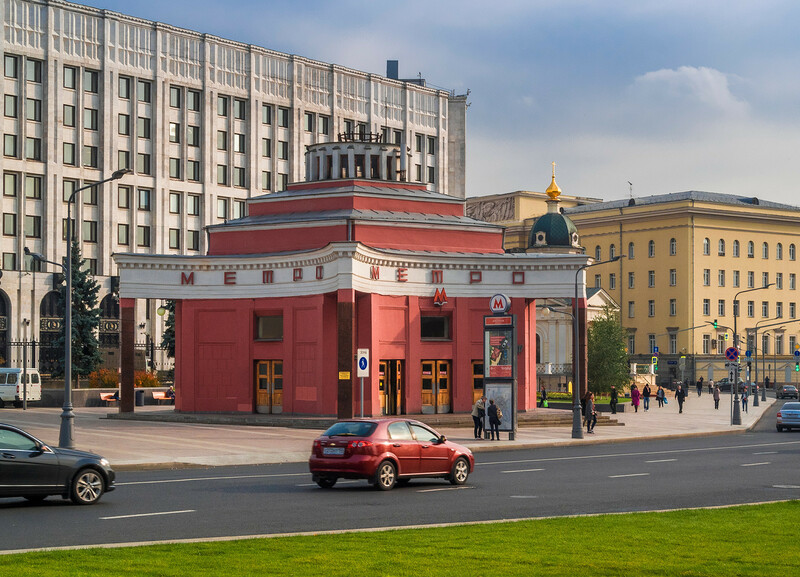 And if you really dig Moscow Metro, here are our articles about the most beautiful and interesting stations of Red Line (1), Green Line (2), Blue Line (3), Orange Line (6), Purple Line (7), Yellow Line (8), Grey Line (9) and Lime Line (10). Or check our literary Metro map.